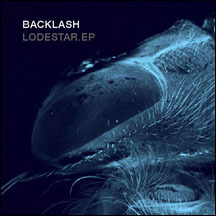 Backlash's first WTII release will be the highly anticipated Lodestar EP. This 35 minute EP features four remixes of the title track, including a mix by Anders Eliasson of the legendary Swedish group Page, an acoustic guitar mix and a Daft Punkesque remix from the winners of the Backlash remix contest. In addition to the title track, Lodestar features new mixes of "Purity of a Sinner" and "Splinter" from Heliotrope and a previously unreleased cut entitled "Man of a Different Mould."